Chili Recipe – Chili Recipes – Easy Chili Recipe | Cook Eat Delicious! A one pot wonder, Chili is one of my favorite comfort foods. Warm, spicy, thick, and full of flavor…what more could you ask for? 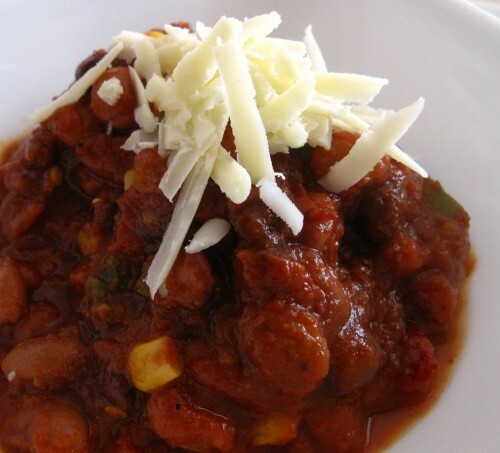 Our recipe for thick homemade chili is a knockout and utilizes the crock-pot. Try an only meat chili or a meat & bean chili. Go vegetarian and skip the meat for a thick chock-full of vegetables chili. Use pinto beans, kidney beans, or black beans for a lot of extra fiber and protein plus a wonderful thickness to the chili. I like a spicy chili so adding extra Serrano chili peppers gives it the spice needed! Chili is definitely a comfort food. It is thick, warm, spicy, flavorful, and served in a bowl! You can top it with cheesy goodness, creamy sour cream, and crunchy chips for texture (frito pie). Sorry if this offends you but meat in a runny chili sauce is not considered chili! No way! Chili has to be thick enough for your spoon to stand in it. Beans are a must in chili and meat is optional. Ever since I bought my crock-pot years ago, Chili has been a home regular. It is so easy to make and delicious to eat. I cook mine for up to 8 hours while I am gone all day. It is so inviting to come home to the smell of chili, yum! I freeze half for another night when I don’t feel like cooking. Delicious Rating: Crock-pot cooking is really one step cooking. Add all the ingredients to the pot and turn on. Nothing to this easy recipe. Add more veggies if you would like or less and add meat. I usual do a vegetarian version with no meat. My chili recipe is actually Vegan but turns vegetarian when you add cheese and sour cream for topping which is really up to you. This recipe never fails to be delicious. The heat is always just right and the flavors meld so well. Drop a comment and let me know what you think of it.